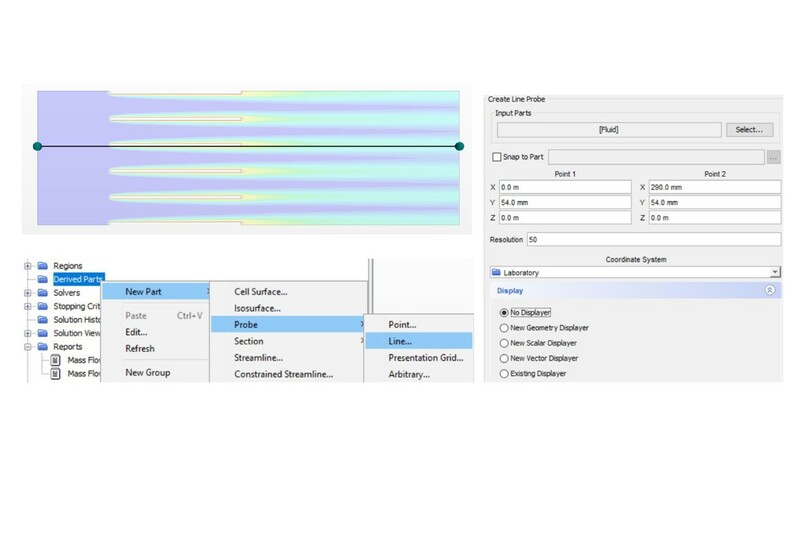 Students would be able to build a flow domain and do basic convection heat transfer simulation after finishing this example. Plain fin is widely used in the industry to extend the heat exchange surface. 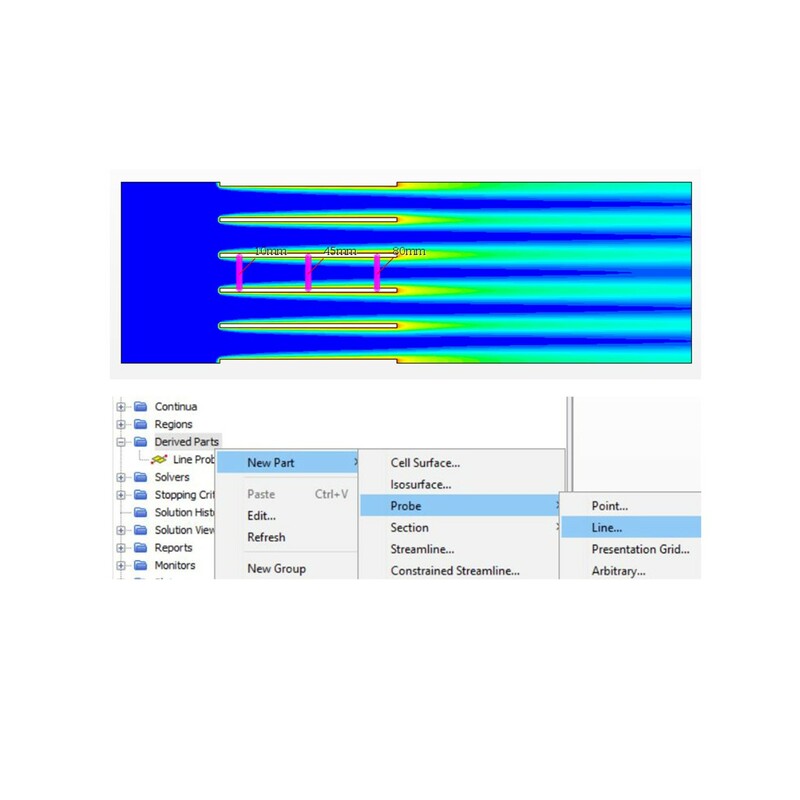 In this example, we simulate the flow between heated plain fins. The model consists of an inlet section, plain fin section, and an outlet section. Pressure and temperature are specified at the inlet boundary, and on the other hand, the outlet is set as atmospheric pressure. Temperature of the heated plates is maintained at 350 K.
To begin with, we will need to create the geometry of the flow domain. 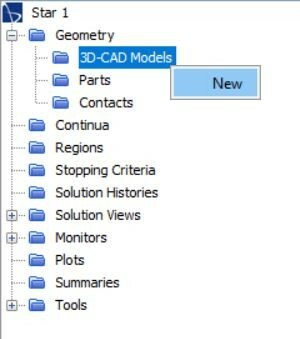 Right-click on the 3D-CAD Models and select “New” to start building a CAD model. 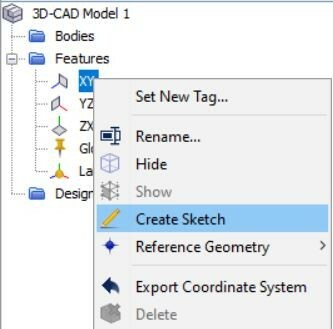 Create a sketch by right-clicking on the XY plane and select “Create Sketch”. For our convenience, we will set the grid spacing of the sketch to 10 mm. 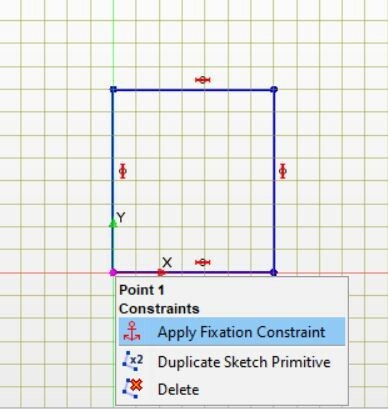 Draw a rectangle that starts from the origin and right-click to apply the fixation constraint at the sketch origin so that the bottom left corner of the rectangle will be fixed when we give the dimensions later. Similarly, draw the other 2 rectangles in the right and specify the lengths as shown. Then, Delete the lines in the middle. 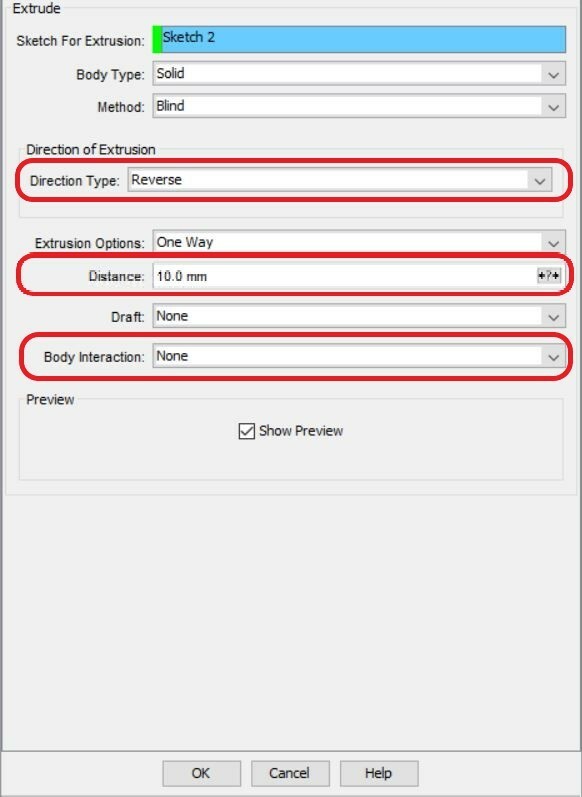 Click “ok” to exit the sketch and extrude the sketch with the thickness of 10 mm. Since we are not simulating the solid parts, we can now cut them out. 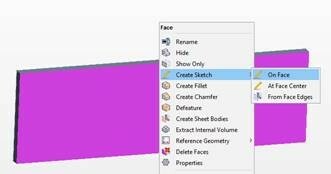 Create sketch on the +z face. 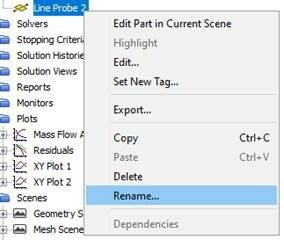 Right click and project the line to sketch and set it as a construction line. A construction line is only a reference. Draw a rectangle on the construction line with the length of 90 mm and the width of 2 mm. Extrude the sketch towards the geometry with the distance of 10 mm and set the body interaction to none. Set the parameters as in the following figures, then the solid parts would be cut out. Close 3D-CAD and go back to the main panel. Rename the body that was created in the 3D-CAD to “Fluid”. We will need to prepare a topology for simulation. The flow domain and the boundary faces would be determined in this step. 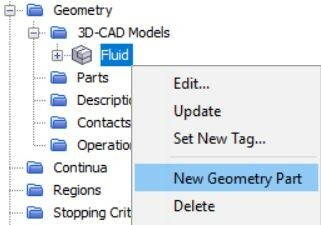 Right-click on the Fluid and select “New Geometry part” and click ok by agreeing to use the default settings. 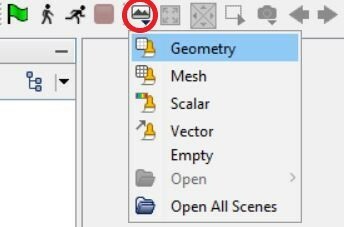 Create a geometry scene from the toolbar. Rename “Body1” to “Fluid” and expand the “Surfaces” under the fluid. 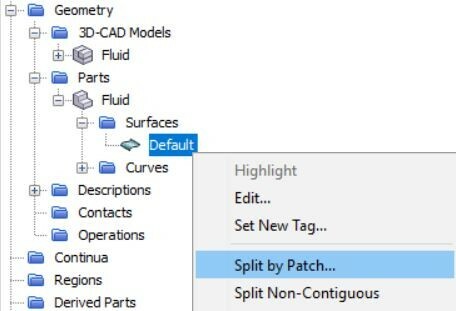 Right-click on “Default” and select “Split by Patch”. Be sure you have created the geometry scene before you execute this command. Name each boundary by selecting the surface from the numbers or from the geometry. Set the surface that lies on the xy-plane as “Domain”. 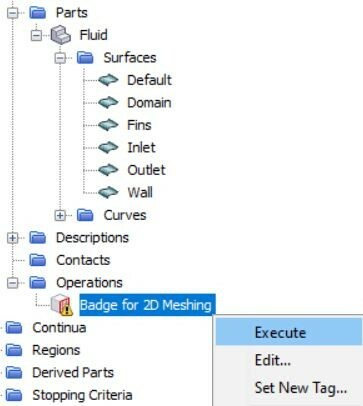 Right-click on “Fluid” in “Parts” and select “Badge for 2D Meshing” and click ok.
Right-click on “Badge for 2D Meshing” and select “Execute”. The flow domain will now be converted to 2D. The solid icon under the “Surfaces” represents the flow domain and the empty icon represents the boundary. The “Default” surface will not be used in the future simulation. 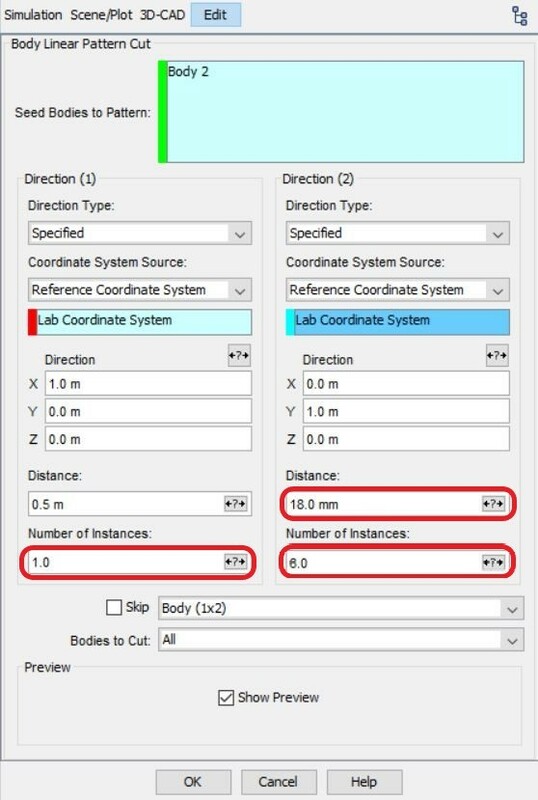 Assigned parts to regions and make a change on the boundary option. 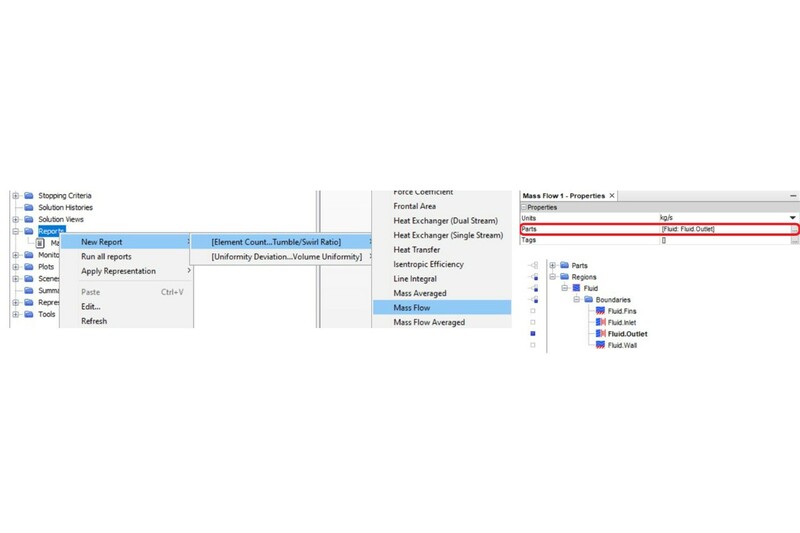 A “Region” would be created under “Region” folder. 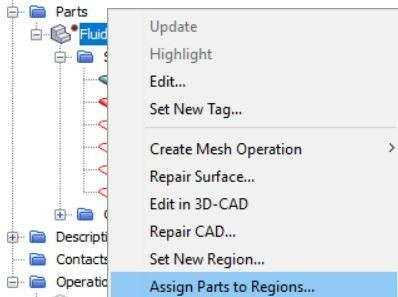 Rename the “Region” under to “Fluid”. Before simulation, we have to discretize the calculation domain, which also called meshing. We can do it by creating the mesh from “Fluid” under “Parts”. 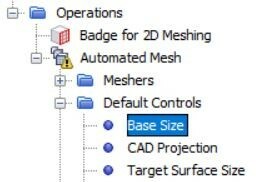 Use “Automated mesh” instead of “Automated mesh (2D)”. 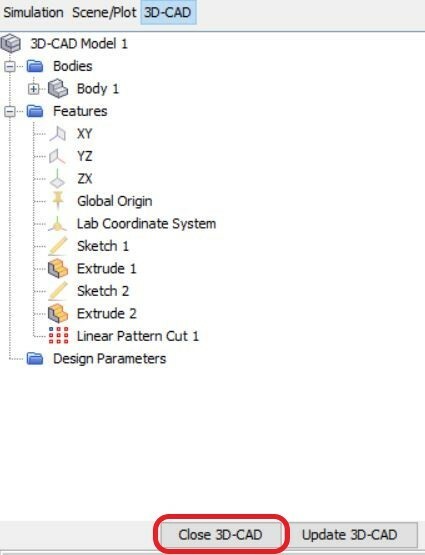 Select “Surface Remesher” and “Trimmed Cell Mesher” as the meshing models. “Automated Mesh” will be created under “Operations”. Change the base size to 1 mm. 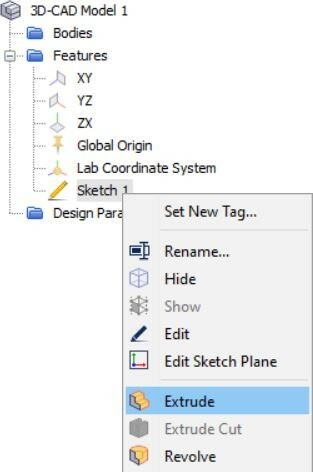 Click on the icon in the toolbar to generate the mesh. Create a mesh scene to check on the mesh in the window. The final mesh will show in the mesh scene. After finishing the selection of physics models, we will set the boundary conditions face by face. The default settings of all the boundaries would be wall, so we have to change them accordingly. The boundary condition of the heated plain fins is wall with constant temperature. 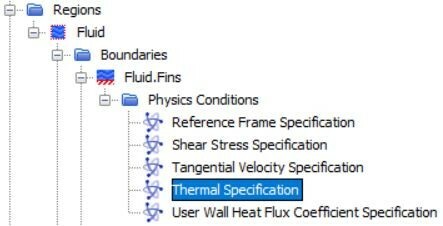 Since the boundary of “Fluid.Fins” is already wall, we will expand the “physics conditions” and change the thermal specification to “Temperature”. 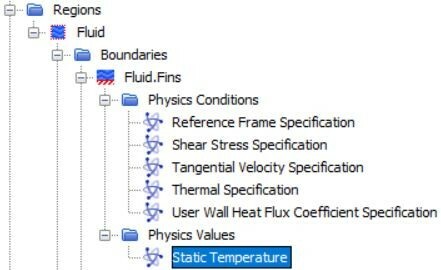 Set the static temperature under “Physics Values” to 350 K. Now, the boundary condition of the plain fins has been specified. We will then set the inlet boundary condition. 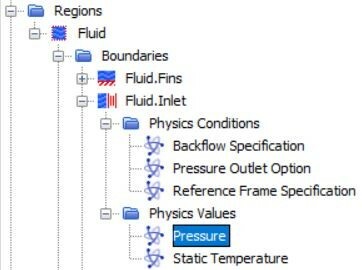 Go to “Fluid.Inlet” and change the type of the boundary to pressure outlet and set the value of pressure to 0.2 Pa.
Set the backflow specification to “static” to keep the inlet pressure as we set earlier. 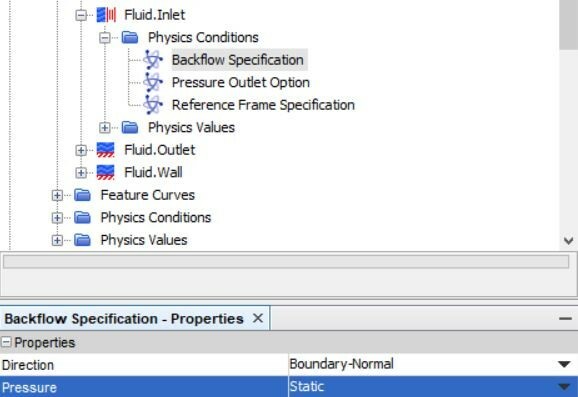 Go to “Fluid.Outlet” to set the boundary condition of outlet. Change the type of the boundary to pressure outlet, and leave the pressure as default, which is 0 Pa. It is noteworthy that the pressure is the gauge pressure. We consider the walls of inlet and outlet section as adiabatic walls so that there will be no heat exchange at these surfaces. To achieve this, go to “Fluid.Wall” and make sure the type of boundary is wall. In this step, we will set up the scenes and monitors. This will allow us to check the results while running. To visualize the temperature contour, create a scalar scene from the tool bar. In the scalar scene, right-click on the legend and select temperature function. 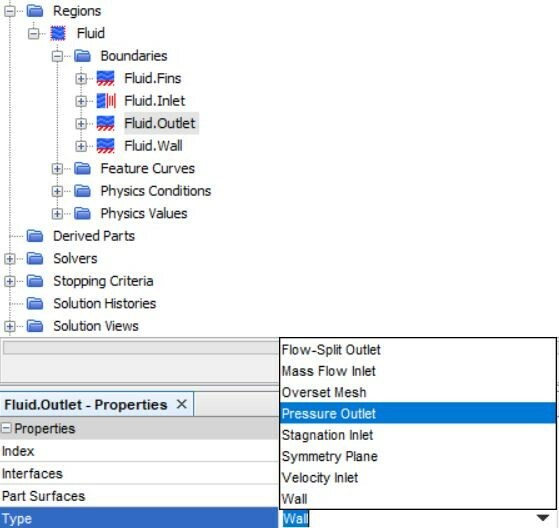 In order to show the mean temperature at the outlet, use “mass flow averaged” in “Reports”. 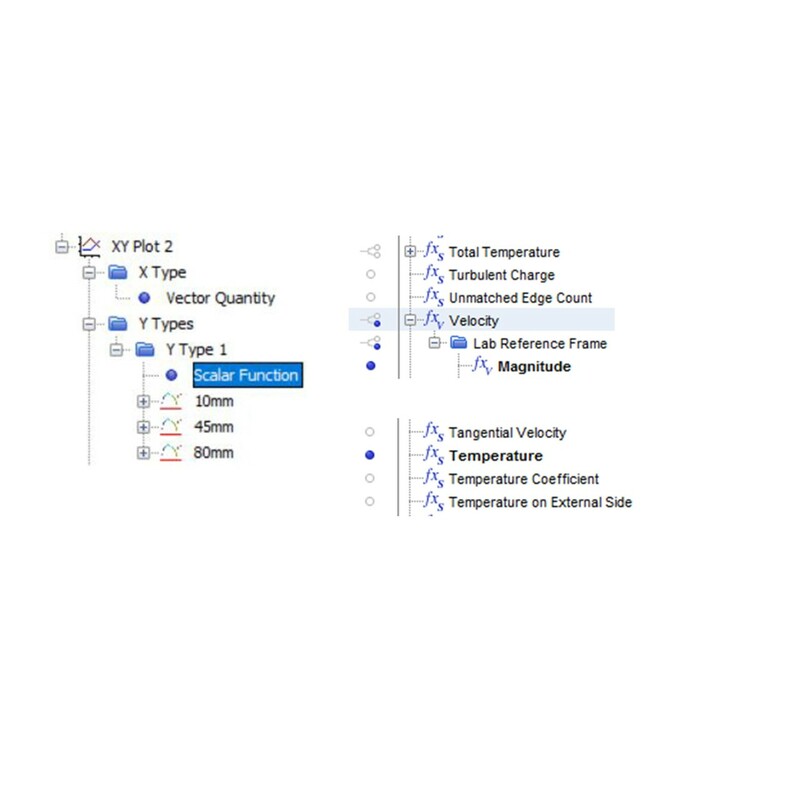 Choose the temperature for the field function and the outlet for parts. Right-click on “Mass Flow Averaged 1” and select “Create Monitor and Plot from Report” to monitor the temperature while calculating. Next, we will have to provide the stopping criteria for the simulation. Set the maximum steps of iterations to 10000 under “Stopping Criteria”. We can also set the stopping criteria by checking the residuals instead of giving a fixed iteration step alone. Right-click on “Stopping Criteria” and create new criterion from monitor. Choose energy in the list. After that, set the “Logical Rule” to “And” and set the minimum limit for “Energy Criterion” to 1E-7. 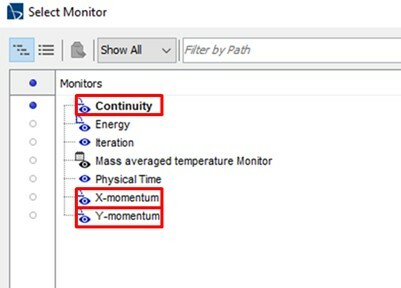 Repeat the previous steps and create other three monitors for “Continuity”, “X-momentum”, and “Y-momentum”. Set the “Logical Rule” to “And”. Set the minimum limit for these criteria to 1E-6. 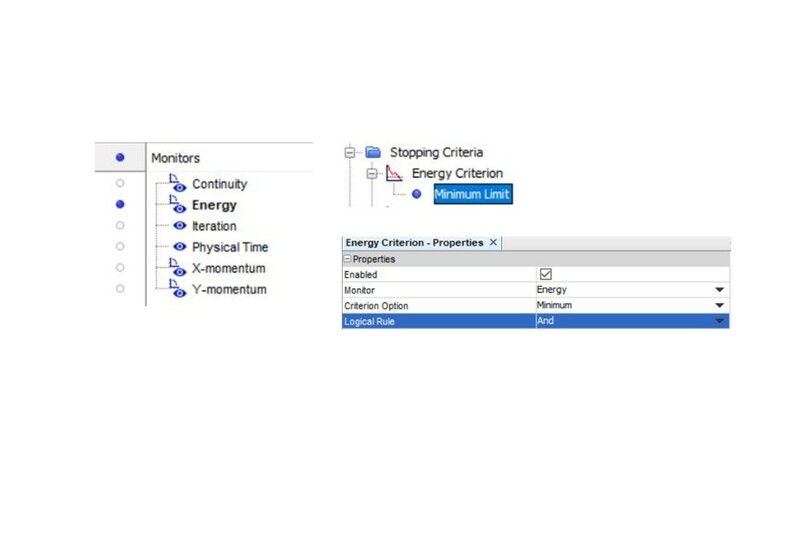 From the settings in the stopping criteria, the simulation will stop when the maximum iteration steps is reached or all of the converging criteria has been satisfied. Select the icon in tool bar and initialize the solution. Click run to start the calculation. Post processing is rather important because we need to examine the result and further analyze it. After finishing the simulation, the temperature contour will be shown in the scalar scene. Double click on “Mass Flow Averaged 1” from “Report” then you can get the mean outlet temperature. 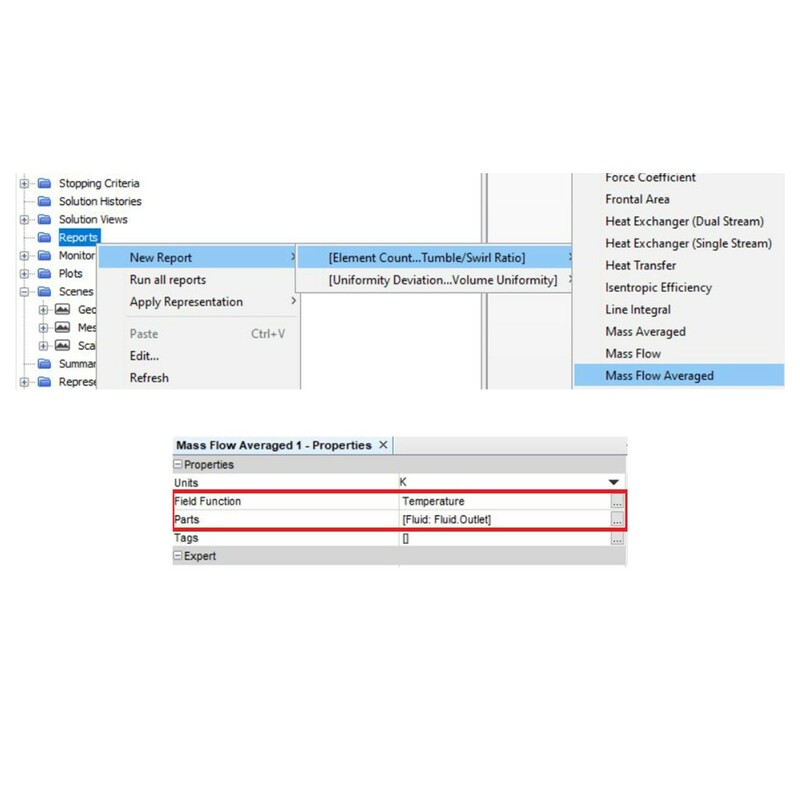 Create a new report for mass flow and assigned fluid outlet to “Parts” at the properties window. Double click on “Mass Flow 1” than you can get the mass flow rate at the outlet. For further examination, we can create a line probe and see how the flow temperature varies along the line. The line probe will locate at the vicinity of one of the fin walls. 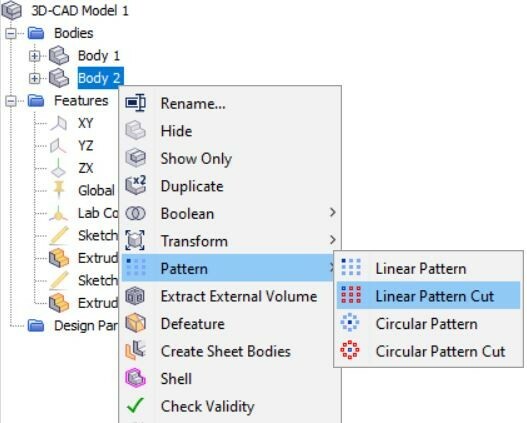 Right-click on “Derived Parts” and create a line from the menu. Set the coordinate of point 1 and point 2 to (0 mm, 54 mm, 0 mm) and (290 mm, 54 mm, 0 mm), respectively. Change the resolution to 50. Select “No Displayer”. Right-click on “Plot” and create a XY plot. Left-click on “XY Plot 1” and click on “Parts” in the properties. Select “XY Plot 1” under “Derived Parts”. Expand “XY Plot 1” and assign temperature to the scalar function under “Y Types”. Change the maximum and the minimum values of y-axis to 350 K and 300K. Similarly, we can create line probes in between fins.Right-click on “Derived Parts” and create a line from the menu for 3 times. Change the resolution to 15. Rename the 3 lines to 10 mm, 45 mm and 80 mm at the corresponding location. 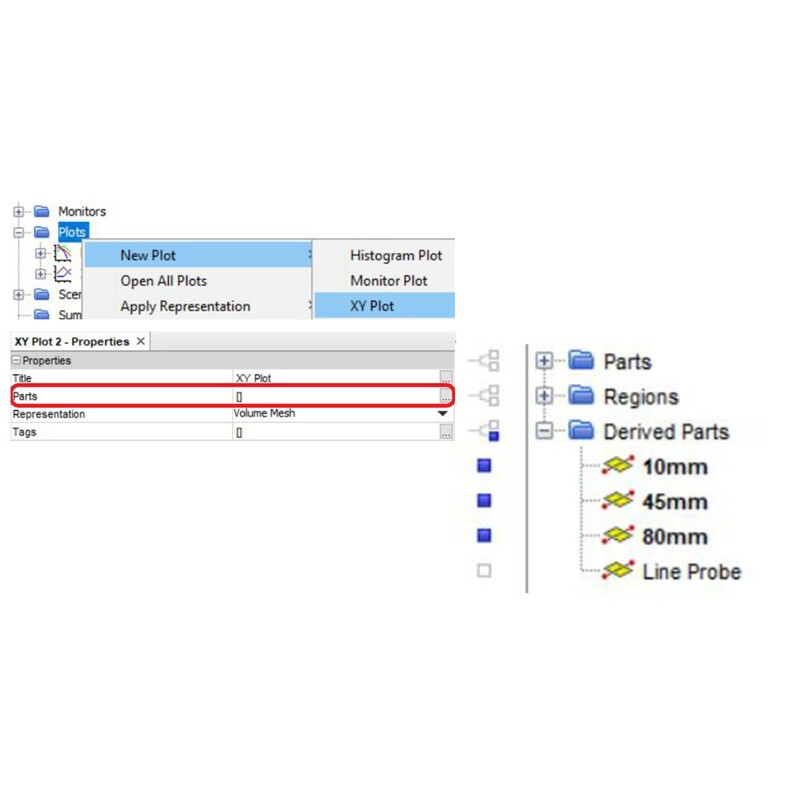 Create a new XY Plot and assign the line 10 mm, 45 mm and 80 mm to the parts in the plot properties. 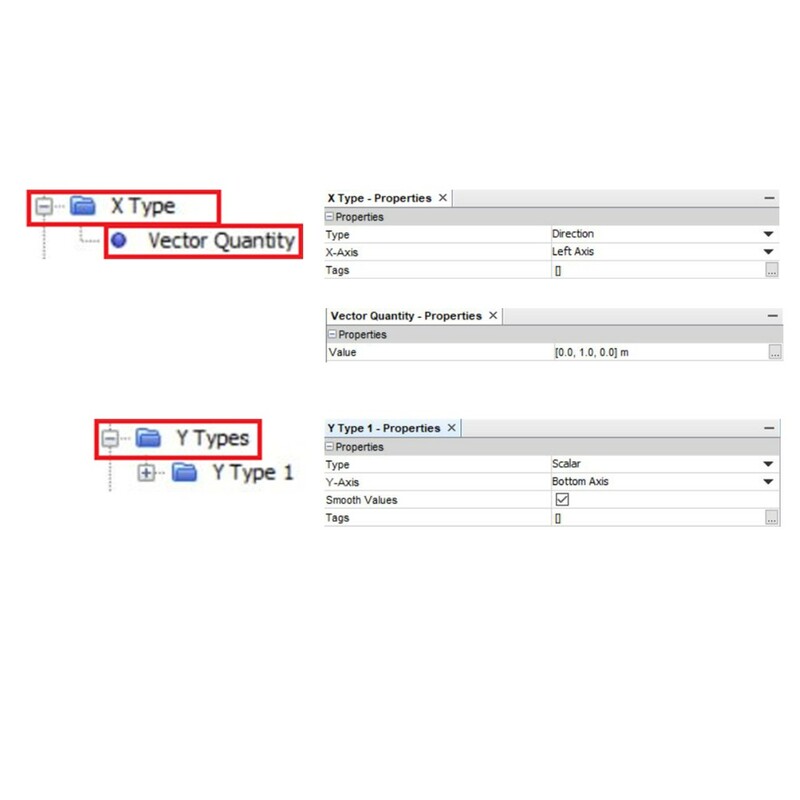 Change the “Vector Quantity” of x-axis and assign x-axis to left axis. Likewise, assign y-axis to bottom axis. Expand “Y Types” and select velocity magnitude in the scalar function for velocity profile. Similarly, Select temperature in the scalar function for temperature profile. 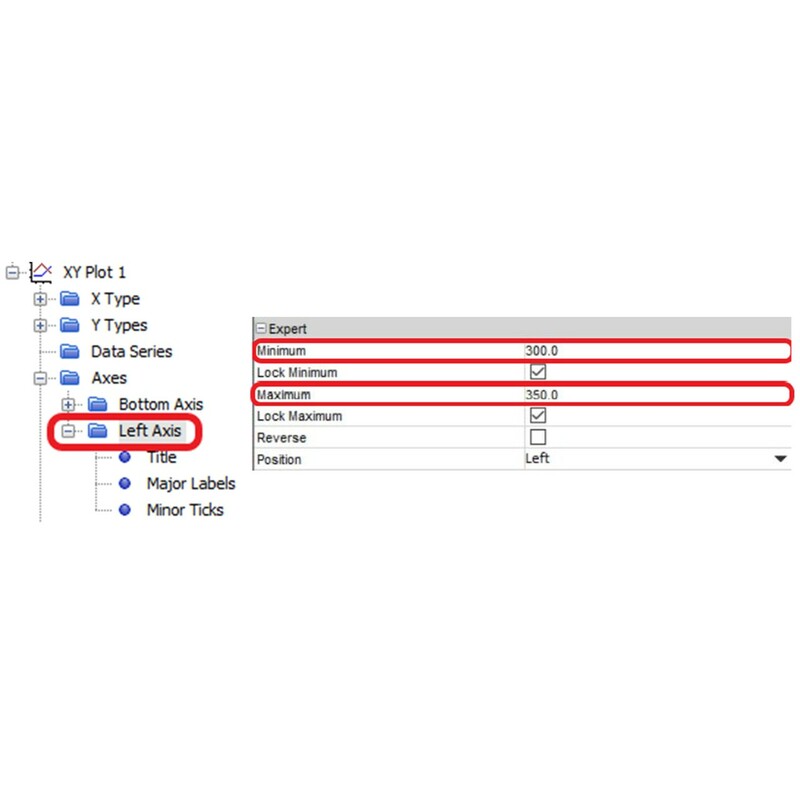 Expand the line probes and select the line style in the properties to connect all of the data points. The final velocity profile will show in the plot if the velocity magnitude is selected as the scalar function. The final temperature profile will show in the plot if the temperature is selected as the scalar function.